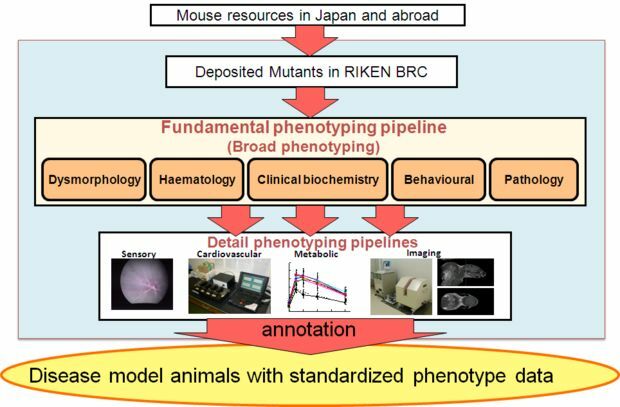 Japan Mouse Clinic (JMC) provides comparative mouse phenotyping platform for mouse strains such as genetically-engineered developed by domestic science community and abroad. We have already established the comprehensive phenotyping platform composed of two pipelines: one is fundamental / in depth pipeline and the other is behavior oriented pipeline, by modification of RIKEN GSC Mouse ENU Mutagenesis Project. All examinations are performed according to the standardized operating procedures (SOPs) to obtain the highly-reproducible data. We will goal to provide the various phenotype information in client’s requested mouse sources and publish the phenotyping data about various available mouse resource to scientific community via our homepage etc. Finally we aim to lead the development of high value-added mouse resources.